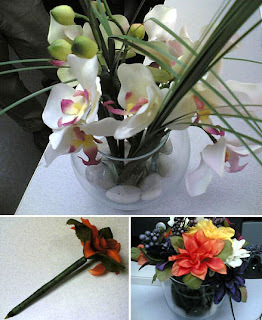 I could also see getting annoyed with having to write with a flower all the time, or the fabric flowers getting dusty and frayed, or pen/flower arrangements just looking bad (it can be hard to make flower arrangements look good, especially with pen flowers, I imagine). A few of my female colleagues at school use this trick with pencils. No boy ever walks away with a pencil that looks like a flower, and the girls all want to know how to make their own.